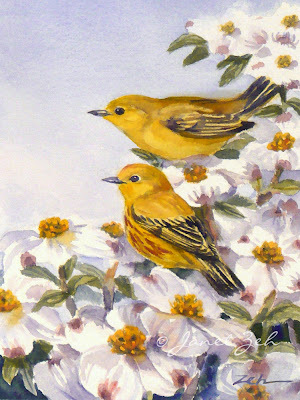 Two bright yellow warblers enjoy a rest in a flowering dogwood tree. The cheerful songs of the birds in Spring and the sight of my dogwood in full bloom inspired this piece. Yellow Warblers print is available in several sizes and may be ordered framed, unframed or on canvas. Click the Order Print button below for sizes, options and prices.